I got my knuckles done by Sam at Artistic Skin Studios in Mesa. 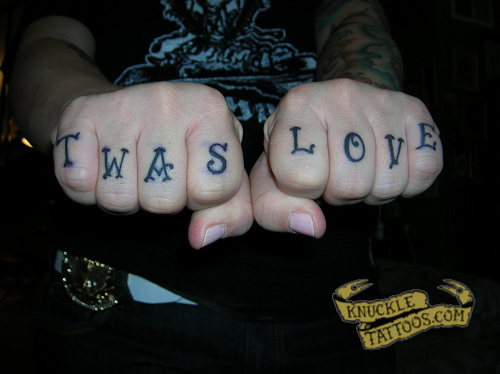 I got TRUE LOVE on my knuckles because I was moving to Chicago to try and apprentice to be an artist out there. All of my best friends live in AZ, so I wouldn’t really be able to see them a lot when I left. My best friend Cassie bought me my knuckles as a going away present. I really do love her, she has always been there for me. So everytime I look at my knuckles, no matter where life takes me, I think about her and all of my friends. Thats my story and Im stickin to it………..